Perhaps it’s just a sign of getting old. Maybe yes, maybe no. But for me now lots of things which are meant to be funny aren’t. For a long time, living in Italy, I would think this was because of the differences of culture; English and Italian, or indeed the differences of English and American, but now I’m not too sure. 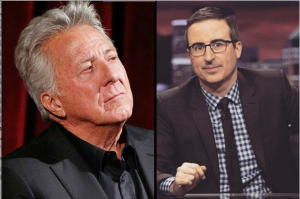 I saw an article in yesterday’s Guardian newspaper about the interview of Dustin Hoffman by John Oliver. John Oliver follows a line of Brits who have become popular as American TV chat show hosts and seems to tap into a David and Goliath phenomena of the little man putting politicians and the great and good on the spot and bullying them into ridicule. We are of course now wearied by the shocking stories of pedophilia and sexual abuse which have come out of the woodwork with uncanny regularity over the past years, and seems to be completely unstoppable. However, in the Hoffman interview Oliver looked like the bully in the school playground poking fun at the smaller kids, with lazy journalism riding high on the Weinstein wave attempting to linch mob the untouchables of fame and fortune. Oliver seems envious of the success of others, and in particularly of those who are obviously more talented, and showed himself to be ignorant of how real artists work (work being the salient word! ): but moreover, perhaps an ignorance of how people in general communicate in many other circles. For example anyone who has worked in a factory, or shop or … take your pick, would know how banter between men and men, or women and women, men and women ( or any possible combination) can sometimes stray from the politically correct, and to suggest otherwise could only be thought of as being both bigoted and puritanical. Hoffman tried to explain that a team working on are film are like a family, with an unwritten code of behaviour, which is unequivocally accepted as admissible and normal by all. The problem however arose on this occasion when an outsider, a 17 year old intern girl, was offended. The matter was trivial but nonetheless apologised for and thought to be a closed matter; regrettable perhaps, but not of consequence. The girl then, a considerable time later, writes a book telling the tale, which is then leapt upon by Oliver as proof of misdemeanour and Hoffman is gleefully set about in his interrogation. As they say he who has no sin throw the first stone, but news has become also a form of entertainment, titillating and gross to boot. Fashions seem to come and go, as do forms of entertainment, and new extremes need to be found to stimulate today what was done yesterday. Perhaps I am getting old!